How much you want to bet they won't care? No, serious. I'll put money on them being okay losing money on their initial titles on those platforms. That # is what banned charts has listed. So it's BS. Especially when Harker is saying no Wii U 3rd party title is close to 500k ww. Oh wow, that's gotta hurt. Their numbers are bogus, and they are known to overestimate sales of games on Nintendo platforms. Damn, the game was fun and there was so much untapped potential left for a superior sequel. I would have loved to see more of this but I understand the decision Ubisoft made. This. Man, this is a huge bummer, it has been far and away my favorite Wii U game to date. Wanting the system to fail is just silly.. I agree it's not something you should wish for as that means people out of work. However it likely will be the only thing that forces Nintendo to really address their issues instead of them simply saying they will. Iwata has said a lot over the past few years and nothing seems to have really changed and the wrong lessons were learned. I think a lot of people would argue that when it comes to tension? I think a lot of people who would argue that probably haven't played through ZombiU in it's entirety. Tension and overall gameplay are 2 different things, of course Last of Us plays better but ZombiU is balls to the walls scary/tense throughout the entire game. Besides, comparing ZombiU to Last of Us is dumb and one of the main reasons mid-tier games have died off. People can't get over themselves and enjoy a solid game for what it is. It's pathetic and downright shameful IMO. I genuinely can't believe how moronic Nintendo is. They had seven years. Seven bloody years. Just what is wrong with them? Why try a gimmick? Why not just create a traditional console which is similar to the Xbox One in terms of power and architecture. With that kind of architecture, at least you'd ensure yourself support from third parties because you allign yourselves to their plans. That would have been a much smarter gamble than this. It's going to be relatively easy for third parties to port between those consoles, they could have easily included themselves in the picture. Then at least you have something. You're not left out in the cold. Not only that, even with seven years, they've shown they were unprepared for HD development. Now, it's Nintendo IP against everyone else. And I'm not sure if Nintendo has been keeping count, but the last couple times that happened, it resulted in bad news for them. Your IP aren't strong enough and a "Wii" console success is more luck than something you can strategically plan consistently. I know they want to stand out, but they managed to screw themselves over there too apparently by including the gamepad which is costing them in terms of price flexibility. It's painful seeing this. They're buffoons after having so much opportunity and potential. It's like PS3, but even worse because no one really gives a crap. Yeah, let's see how far that gets you. Your Luigi hat is on too tight. Nintendo still trying to bank on the grandmas with super cheap hardware is pathetic. They're playing safe and it's killing them. The wii success was all luck and the wii brand is dead since 2008. People don't care because everybody remember having a wii accumulating dust with crappy third-party waggle games. It's the atari all over again. Even if it's only one, it would probably be a 100% more. WiiU is certainly a cheap console to make. I don't think it is working so far. It was made in Bulgaria. ZombiU was made in France. Am I missing something? 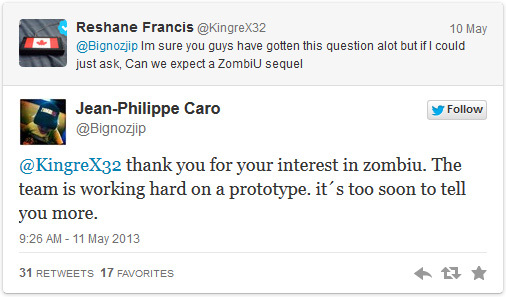 How is it EA's fault that Zombi U failed? What does this have to do with EA? I'm aware that that's the number Chartz is providing. I'm just willing to give the benefit of the doubt for a moment and question whether another source that isn't that site is citing that number. that was the ether. scathing. I'll still grab a wiiu once the smashiest of bros comes out. It's OK Peter....it's not like the EA servers would still be up anyway. Still, Nintendo is just idiotic in how they've handled the Wii U. I keep thinking of a great reason to get one and I can't think of anything. I want Pikmin 3 & The Wonderful 101 to do well but it feels like tide-me-over games until Nintendo finds a 'killer app' to actually get people to buy the system. As much as it pains me to say it, I wouldn't buy a Wii U for Pikmin 3, The Wonderful 101 or even Bayonetta 2. It would have been without the Gamepad. Sad news on the ZombieU front. I'd say, though, besides the terrible name and box art - how many copies of a survival horror game did you expect to sell? Isn't that a fairly dead genre? Oh, well, I guess I'll just keep playing Monster Hunter on my Wii U because there's not a lot else that's going to be arriving on there from a third party for a long, long time. "Ever" is a long time! Meh, Nintendo shouldn't care about third parties. They should care about their console and their games selling and 3rd parties didn't play a role in that for Wii outside of maybe Ubisoft with their dance game crap. Wii U has other problems, the Gamepad and Nintendo's low output are big factors. While I generally do agree with you about Nintendo's priorities as a business, the problem is third party support is the backbone of the industry. Without it, Nintendo's consoles are left with software droughts, lacking in popular genres (like FPS and Sports), and shorter console life cycles (comparing Wii to PS2 and PS3/Xbox 360 ). Nintendo can only commit so much of its resources to annual third party publishing deals for exclusives. Even though Nintendo fans generally don't buy as many hardware third party games as Xbox and PlayStaton fans do, third party support is still necessary despite its diminished presence on Nintendo home consoles. Haven't you read the latest talking points? It's everyone's fault BUT nintendo whenever there is negative Wii U news. Wow that's pretty lame. ZombiU was the best launch game. Hell the bundle it received is why I bought a WiiU in the first place. Would've been better for them to do a port to PS3/360/PC and seeing how that goes before killing the franchise off. While gamepad play was a noticeable feature you can have the game without it. Not to mention use it as a selling point for the WiiU or incorporate smart glass, vita second screen, etc. I think it will have some legs... It's 30$ in the eShop! Wow, straight from the horse's mouth. If he's that blunt about things then it doesn't bode well for the Wii U when it comes to future Ubisoft support. Too bad. I haven't put as much time as I'd like into Zombi U, but from what I've played the game is pretty great. Really tense and a great atmosphere. I really doubt that $150 price tag for gamepad is real though. It doesn't have high res capacitance screen, nor it has large battery. Nintendo is clearly trying to milk the money as much as they can, while they can. At this point WiiU at $199 doesn't even look like a bargain. At this point, does anyone have any hard data on which Wii U third-party game actually turned a profit? And if so, how much? Sad to hear this happening once again for Nintendo. It's like they can't get a break when it comes to third-party support...the curse of Square at work? That's bad, the game is nicely done and has one of the best uses of the Gamepad. I am part of the problem, as I tried the demo and liked the way the game is done but I am not really into the horror games. Not really. These sort of things (continued success with outdated hardware and mediocre services) can influence the overall direction of the industry, so it kinda makes sense to root for stuff you don't like to fail. Plus, it's just good fun. If you have fun rooting for the failure of a video game developer and the corresponding layoffs, then I feel sorry for you. What a depressing way to look at the world. It's a dead system. Oh well. Expressing any sort of like / dislike of any company seems to be a 'fanboy' thing. I'm not sure that word actually means anything. EA's servers for Burnout Revenge 360 are up after over seven years. Is being snarky about EA the proper reaction? Their criticisms make perfect sense. If people aren't buying Wii U systems to play online sport and shooter titles, why should publishers release online sport and shooter titles for Wii U? thread title has changed. i see a good future for this thread.